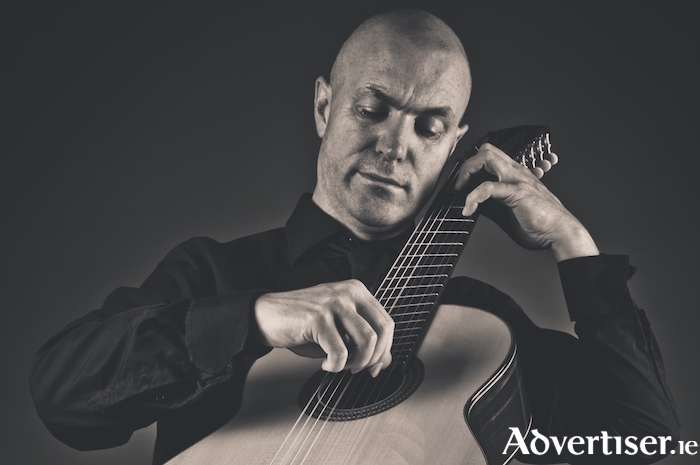 REDMOND O'TOOLE, described as "an important ambassador for the classical guitar in Ireland" by the Royal Irish Academy of Music, is coming to Galway next week to play a lunchtime concert. O'Toole will perform music by Domeniconi, Haydn, and Bach on Wednesday February 28 in the The Cube Theatre, NUI Galway, at 1pm and in The PorterShed, Eyre Square, at 6pm. An award winning and critically acclaimed musician, both his instrument and playing style are unorthodox. The Wicklow man plays a Brahms guitar, invented in 1994 by Paul Galbraith and David Rubio. It features eight strings, as opposed to the normal six, and O'Toole plays the guitar, not across his leg as is the standard position, but upright in the manner of a cello. He has performed at the Passau International Guitar Festival in Germany; the National Concert Hall and RDS Concert Hall in Dublin; at the Hallein Guitar Festival in Austria; and with the BBC Ulster and the Irish Baroque orchestras. The concert is an 'MFG Lunchtime Concerts and The PorterShed Sessions presents...' event. Admission is free.